Coverage: Live on BBC Two, Radio 5 live sports extra, online, tablets, mobiles and BBC Sport app. Britain's swimmers have proved they can challenge the best with their success at the World Championships in Russia, says head coach Bill Furniss. Four days into the eight-day event, Britain have won four golds - twice their previous best at the Worlds. 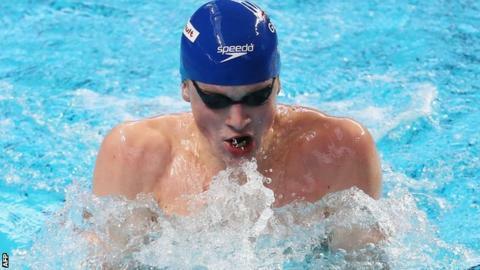 Adam Peaty missed a chance to add to his three gold medals when he went out of the 200m breaststroke in the heats. Andrew Willis qualified fifth fastest, while Danny Wallace finished fourth in the 200m individual medley. American Ryan Lochte won the medley to become only the second man, after Australian Grant Hackett, to claim four successive world titles. "We came here with a target to swim as best as we could and the medals will look after themselves," Furniss, who has been in the post since February 2013, told BBC Sport. "Everybody else puts medal targets on us. Our message to the team is that we have to put our best performance at the biggest meet of the season and that's what we've done. "You have to earn and justify any rewards you get. It's much more challenging now but in a relaxed way. "My mission was a change in attitude, mindset and belief. "If you look at our athletes, they will take on the world; they won't stand back. They won't ask for any quarter and they won't give any quarter." Peaty, who finished 26th in the 200m heats, has won 50m and 100m breaststroke titles in Kazan and was part of GB's gold-winning mixed 4x100m medley relay team. The 20-year-old, who favours the 50m and 100m events over the 200m, is the first Briton to win three golds at a single World Championships, and could add to his tally in the men's 4x100m medley relay on Sunday. GB's Molly Renshaw failed to qualify for the final of the women's 200m breaststroke, while the British women's 4x200m freestyle relay team came fifth as the United States took gold.